A dialogue and resource on turning sustainable behaviors into brand assets. New Survey: Only 10% of Americans trust business to behave ethically. 96 percent of Americans believe it is important for companies to ensure their employees behave ethically but only 10 percent have trust and confidence in major companies to do what is right. Pharmaceuticals and health insurance were viewed to be the least trustworthy industries. The most trustworthy were thought to be manufacturing, technology and large retailing. Princeton Survey Research Associates International’s 2015 Public Affairs Pulse survey polled 1,600 Americans on their attitudes about corporate behavior, big business and small business, the trustworthiness of companies and industries, levels of regulation, and lobbying and politics. The study found the vast majority of the public expects the business sector to think beyond profits and be valuable components of society. More than nine in 10 Americans say businesses need to protect the environment, including 76 percent who feel it is very important that businesses limit their environmental damage. 39 percent believe it is very important that businesses take more responsibility in helping the government solve problems. 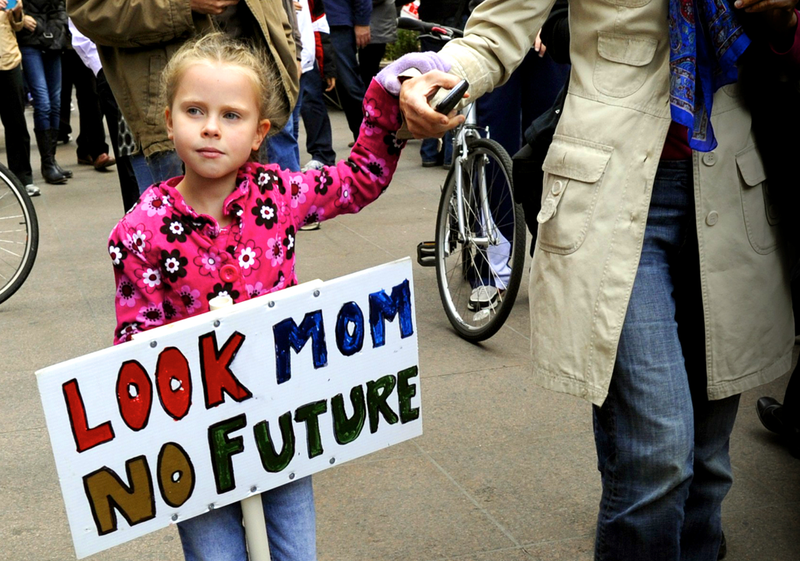 How can companies communicate what they’re doing for these causes? Social media is reportedly the best way that companies can communicate what they are doing for social causes, with 45 percent calling it very effective and 38 percent calling it somewhat effective. Not surprisingly, those under 50 years old were more strongly in favor of social media communication than those over 50. Only 15 percent say social media has a significant influence on their opinions, while almost 40 percent say it does not influence their opinion at all. Personal experiences as a customer or employee of a major company were the top factors influencing people’s opinions of a business. According to the 2014 State of Green Business report published by GreenBiz Group in partnership with Trucost plc., companies around the world are struggling to make progress on climate change, resource efficiency and natural capital dependency. “While more and more companies are undertaking a growing number of initiatives to reduce their environmental impacts, there’s very little progress to show for it. Company initiatives are not having an impact at the scale needed to address such challenges as climate change and the availability of water and natural resources,” said Joel Makower, GreenBiz Group executive editor and the report’s principal author. The seventh annual edition of the report, which measures the global progress of large, publicly traded companies in addressing a myriad of environmental challenges, reveals little meaningful progress across most metrics, including greenhouse gas emissions, water use, waste disposal and other pollutant impacts. “The environmental impacts of business – air pollution, biodiversity loss, ecosystem degradation and water scarcity – are threatening the ability of our finite stock of natural capital to deliver sustainable growth,” said Richard Mattison, CEO of Trucost. “The challenge for business is to identify growth models that result in reduced environmental impact. 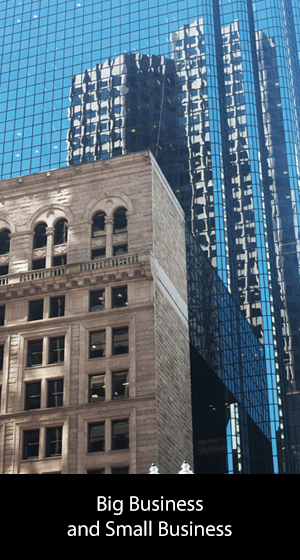 ”The report also names the 10 sustainable business trends for 2014. Among them are the growth of collaboration among big corporations to solve mutual sustainability challenges, the growth of chemical transparency for consumer products, the emergence of “shadow pricing” as a means for companies to assess their environmental risks and net-positive buildings. The 2014 report includes the launch of the Natural Capital Leaders Index, a new methodology for identifying companies that are growing their revenue while reducing their environmental impacts. The 2014 Index found 34 companies from 10 countries that met Trucost’s criteria, which include increasing revenue between 2008 and 2012, disclosure of greenhouse gas emissions and a decrease in environmental impacts during that same period.Among the 34 “decoupling leaders” are Carnival Corp., CSX, Intel, Kimberly-Clark, National Australia Bank, Pearson, Tata Power and Verizon.The Index further identifies US and Global “efficiency leaders” that use the least natural capital to generate revenue compared to sector peers – the more traditional sustainability leaders – which include Adobe Systems, AMEC, BMW, Ford, Manpower, McGraw Hill Financial, Pepco Holdings and Sprint Corp.The metrics from the report were drawn from Trucost’s assessment of 4,600 of the world’s largest companies representing 93% of global markets by market capitalization.The State of Green Business report will be the centrepiece of the upcoming GreenBiz Forum (Feb 18-20), taking place in Phoenix, AZ, where speakers will address many of these trends and metrics.The free report can be downloaded from GreenBiz.com. Re-Thinking Consumption: 66% of consumers agree we need to consume less to improve the environment. According to the newly released The Regeneration Consumer Study, two-thirds of consumers in six countries say that “as a society, we need to consume a lot less to improve the environment for future generations” and that they feel “a sense of responsibility to purchase products that are good for the environment and society”. The findings are based on an online survey of 6,224 consumers across Brazil, China, India, Germany, the United Kingdom and the United States conducted in September and October 2012. Nine in ten consumers believe it is extremely or very important for companies to address safe drinking water. 67% are interested in sharing their ideas with companies to help them develop better products or create new solutions. 75% of consumers globally agree they would purchase products that are environmentally or socially responsible if they didn’t cost more. 3. Embrace sustainable brand innovation. 5. Unleash the power of tribes. Read a copy of the research report here. Developed by BBMG, GlobeScan and SustainAbility, The Regeneration Consumer Study is an in-depth online survey of consumer attitudes, motivations and behaviors relating to sustainable consumption among 6,224 respondents across six major international markets (Brazil, China, Germany, India, the United Kingdom and the United States) conducted in September and October 2012. Drawn from consumer research panels, global data are comparable to having a margin of error of +/- 1.3 percent. Analysis of country-level data reflects a margin of error of +/- 3.1 percent. The study is part of the The Regeneration Roadmap, a collaborative and multi-faceted thought leadership initiative designed to engage the private sector in advancing sustainable development by improving sustainability strategy, increasing credibility and delivering results at greater speed and scale. Presenting Sponsors of The Regeneration Roadmap are BMW Group and SC Johnson. Sponsors include Cisco, DuPont, Interface and Pfizer. The Regeneration Consumer Study is sponsored by Brown-Forman, Campbell Soup Company, Itau, L’Oréal, Shell and Starbucks. Gibbs & Soell: Only 21% of Americans Believe Business Is Committed To Going Green. In their 2012 Gibbs & Soell Sense & Sustainability study, the research demonstrates that public doubt that corporations are making a sincere commitment to going green continues to run high. Despite their skepticism, the majority (71 percent) of consumers wants to know more about what companies are doing to become sustainable and green, and 75% feel the media are more likely to report on green business when the news is bad rather than good. Read the summary report and news release announcing the results of 2012 Gibbs & Soell Sense & Sustainability Study at these links. While one-third of executives report having no green steward, up from years past, there is a trend toward dedicated teams for those who do. This year’s results show that 34 percent of executives indicate there is no one at their company who is responsible for sustainability or “going green” initiatives, up from 25 percent in 2011. More than one out of five (21 percent) corporate leaders report there is a team of individuals whose jobs are specifically and solely dedicated to sustainability, up from 17 percent in 2011 and 13 percent in 2010. Most consumers and business executives also believe corporate sustainability activities are more likely to be covered by the media when the news is bad than good. The number is comparatively higher among consumers who are confident in corporate America’s commitment to “going green.” Three-quarters (75 percent) of U.S. adults and 69 percent of executives feel the media are more likely to report on “bad news” than “good news” when covering how companies are addressing efforts to “go green.” Specifically among the 21 percent of consumers who believe “most,” “almost all,” or “all” companies are committed to “going green,” 83 percent feel there is a bias for bad news in the media. 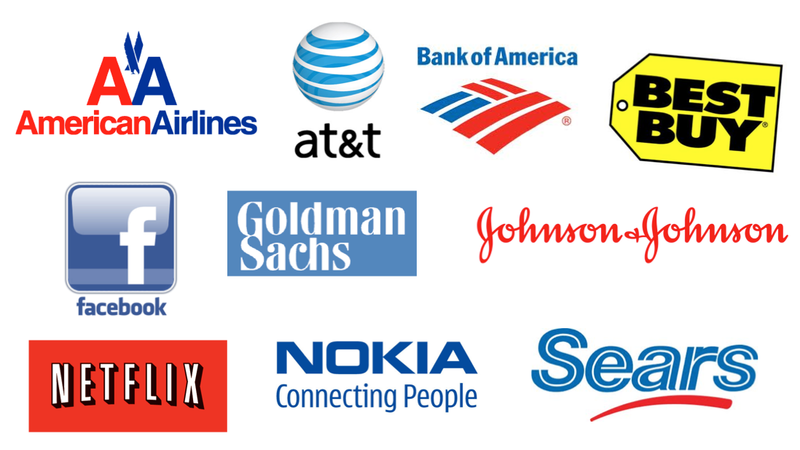 24/7 Wall St.: The Ten Most Hated Companies In America. 24/7 Wall Street’s analysis was based on a rigorous study of two dimensions. One is public research about consumer satisfaction, customer care, pricing of products and services, and brand impressions. Wall St. research takes into account another set of factors, which include present earnings, profit forecasts, product development and quality, and brand valuations. Here is how they did their research. BrandAsset® Valuator: Fewer trust brands but trust is key to building brand equity. Kudos once again to our friend John Gerzema and his team at BrandAsset® Valuator for another compelling report on the key trends related to trust, brands, and the rise of the what they deem “The Citizen Marketplace”. That trust is the true, new brand differentiator. 25% of people surveyed trusted brands in 2009, down from 49% at the beginning of the decade. 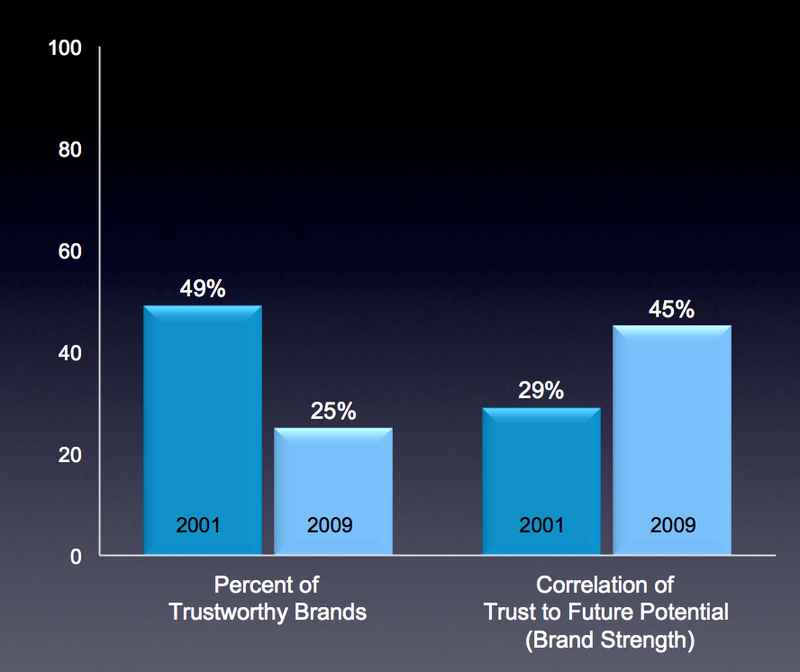 45% cite trust as key to future potential or brand strength, up from 29% in 2001. Other key findings in the research is the rise in social media as social contract with trust of social media outlets outpacing that of traditional media (and Twitter leading the trust game among social media outlets). John and his BAV team conclude the following branding imperatives in the era of the Citizen Marketplace. Companies must not think social media, but ‘social as business model’. Download a BAV presentation on the research here. Thanks again BAV team for sharing this insightful work. Edelman Trust Barometer: Only 46% of Americans trust business to do the right thing. 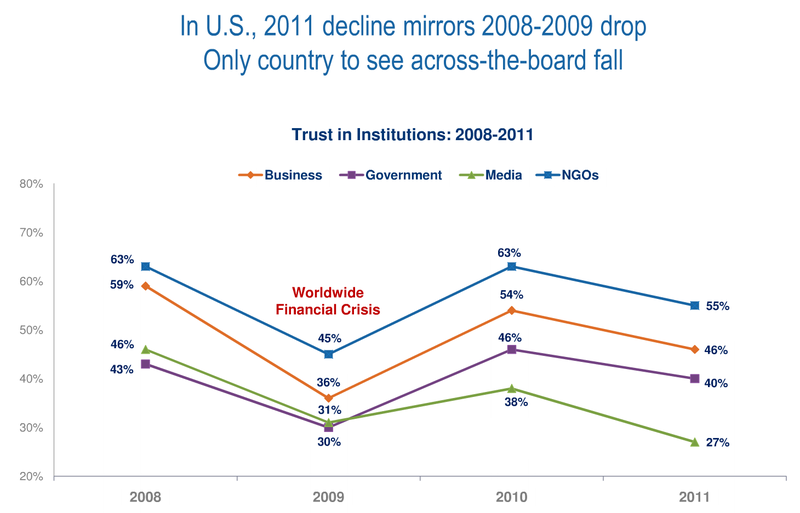 In their 11th annual global survey on trust, Edelman research reports that people’s trust of institutions and returned to levels comparable to the height of the worldwide financial crises in 2009. When asked how much they trust various institutions, only NGO’s were trusted by the majority of U.S. respondents. Business, government and the media are not trusted by the majority of people and media’s trustworthiness as reached record lows. The drivers to corporate reputations are quality, transparency, trustworthiness and employee well-being. The study concludes that businesses must align profit and purpose for social benefit. It reports that people’s demands for authority and accountability are setting new expectations for corporate leadership and that trust is the essential component to both protect reputations and gain tangible benefits. Lack of trust is a barrier to change.